Stalls can be cleaned perfectly in about 4 minutes with a horse stall cleaning machine. 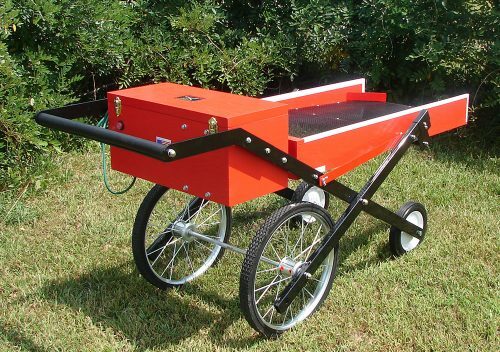 The amazing Brockwood Stall Shi*fter® is an electrically operated horse stall cleaning machine. It does more than just clean horse stalls, it conditions them by completely sifting and aerating all the bedding and removing all the manure, even particles as small as a kernel of corn! Other mechanical and manual methods allow much larger pieces of manure to remain in the stall. That’s not good enough for discerning barn owners and managers. The Stall Shi*fter is also used to sift the bedding of pens or stalls of other animals such as miniature horses & donkeys, llamas, alpacas, goats and exotic zoo animals like giraffes and zebras; it’s the most versatile horse stall cleaning system on the market. No other system matches the quality of the Stall Shi*fter’s construction and materials or the cleanliness of the stalls when finished. You will save up to 50% on bedding costs and cut horse stall cleaning time and labor up to 65%. The more horse stalls you clean the quicker the Stall Shi*fter will pay for itself, and it will continue to repay your investment of $2249.00 many times over as years go by. Join over one thousand happy users now. In addition to saving you thousands of dollars a year in bedding and labor expense, this horse stall cleaning system will make your stalls cleaner than you can possibly clean them with a fine tine manure fork using the manual horse stall cleaning method. Do you suffer from manual horse stall cleaning induced tennis elbow? (some call it “manure elbow”) This is most commonly caused by the palms down labor of shaking a manure fork. When using a Stall Shi*fter as recommended the palms down labor is replaced with palms up labor, shoveling not shaking. Tennis elbow is not aggravated by palms up labor and typically abates after a week or two of shoveling not shaking. I speak from experience because I was suffering from very painful tennis elbow before I changed my horse stall cleaning method from manual to automatic using the Stall Shi*fter. They say necessity is the mother of invention and I can attest that in this case, it was true. Read more about some of the benefits of owning a Brockwood Stall Shi*fter®.